James Herbert's best-selling ghost story The Secret of Crickley Hall is to be adapted into a BBC One drama starring Suranne Jones. The story is about a family who move to Crickley Hall to start a new life after their son goes missing. But they quickly discover the building is haunted and events there begin to terrorise them. Jones will be joined by Miranda actor Tom Ellis and Douglas Henshall, who starred in Primeval. 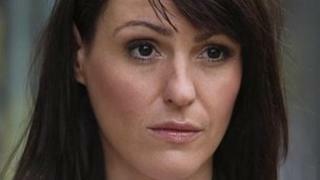 Jones, who is best known for playing Karen McDonald in Coronation Street, called the storyline a "classic haunted house spine-chiller". The three-part drama will be scripted and directed by Joe Ahearne, who has worked on dramas including Ultraviolet and Doctor Who. "Everyone loves a good ghost story and James Herbert is an iconic writer in the genre," he said. "He's come up with a really thrilling and moving story that delights you while it's terrifying you," added Ahearne. The adaptation of Herbert's ghost tale comes shortly after the revival of another haunted house story. Daniel Radcliffe's The Woman In Black recently became the most successful British horror film since records began 20 years ago. The film, based on Susan Hill's novel of the same name, topped the UK box office for three weeks and has taken a total of £14.5m since it was released in February. In a separate casting announcement, comic Vic Reeves has signed-up to play a merchant sailor in another new BBC comedy drama. He will play Tony Dixon in the six-part series Hebburn, which is based around his on-screen son Jason, who leaves his Tyneside home to seek out the "bright lights and glamour" of Manchester. Fresh Meat actress Kimberley Nixon will play a middle-class Jewish girl who Jason secretly marries. The sitcom has been created by stand-up comedian Jason Cook, who will also appear in the show, based on his own experiences of growing up in the north-east of England.